Leader of the Russian Communist Party Gennady Zyuganov has predicted the rise of leftist ideologies across the world and in Russia, warning that if the country’s leadership continues to only “imitate political changes,” it may be overthrown. Globalization based on speculative finance resulted in the current recession and the eurozone ciris, and the public knows that “a financial monster must be defeated and social policies must be changed completely,” the Communist Party (KPRF) chair said. In his opinion, Russia has always been a leftist nation. 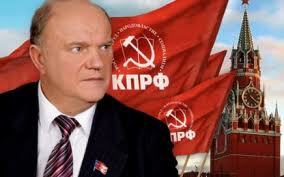 Zyuganov is therefore confident that current levels of income inequality in the country will not last forever. The KPRF head added that the current crisis is also an existential one: Humanity is uncomfortable living in an unequal world without ideals or dreams, only greed, consumerism and double standards. In Zyuganov’s opinion, politics in Russia should be based on four principles: Strong power, collectivism, spirituality and justice. In other words, strong military, enforced social cohesion, control of religion and widespread redistribution of wealth. Who ya gonna believe? Obama, Biden, Clinton, and Panetta, or Russia’s Communist Party leader and your lyin’ eyes?